I thought I’d better cram two days worth of efficiency into Monday, as tomorrow looks like being a day of lying down with a cold cloth on one’s head as the road melts outside. So I leapt out of bed and got myself up to Bunnings to get some batteries, latches and what I discovered were called casement stays. Then on to Logan’s pianos for a piano book for the Horror to stop him playing the one song over and over on the piano. Then off to the gym. I really do want the windows in the lounge room to stay open. 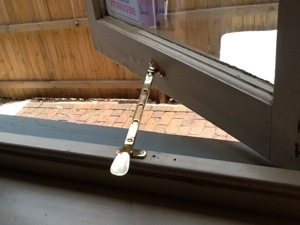 Apparently they are casement windows and they need a little brass stick arrangement attached to them to keep them open. I got out the set that I’d purchased at Bunnings and had a good look at them. They looked like the ones elsewhere in the house – thank goodness we have them elsewhere in the house or I’d never have known where to start, they didn’t come with instructions. Then I thought I’d have a shower, and perhaps some lunch to fortify myself. OK, back to the casement stays. Actually, no, I might fit a latch to the back gate first, that will be an easier warm up job. It swings shut in the wind and shudders itself loose, so it needs to be hooked back. Well, the latch I’ve purchased is way too small for the job. Back to the casement stays. I spend ten minutes extracting it from its shrinkwrap with a screwdriver and a large pair of scissors while fending off questions from the bored Muffet. “What’s that?” she asks. “You’re just asking me because you’re bored, you don’t actually want to know, and you’re going to ask more annoying questions when I tell you what it is” I reply, knowing that it won’t stave off the inevitable. “I don’t care, what is it?” “Casement stays” I sigh in reply. Fortunately the Horror does something more than usually annoying and is kicked at by his sister. He delivers what sounds to me like a sincere apology. I test him by asking him to empty the dishwasher. He does it. The Muffet, instead of graciously accepting his apology, shouts at him. I ask her to apologise now and give her brother a kiss. She eventually does, but then has to run off to wipe her lips with Dettol and go sulk in her room. That’s got rid of her. I sit the casement stays on the window they’re going to keep open. My goodness my dear, that windowsill is really filthy. I dig out some Enjo and give it a good wipe down. OK. Right. I go back to look at the existing casement stays in another room, opening and shutting them. I consider taking a photo of them. No, no, I can remember. I get out my 2B pencil and draw around the bit that will sit on the windowsill and the bit that will attach to the window. Then I get out my ladies drill and drill tiny holes where screws will go. I’ve learnt from long experience that it’s faster to do this than to try and force the screws straight into the wood. Dagnabit, flat headed screws! Who uses them any more? They’re extremely annoying to tighten even with a manual screwdriver, and a power drill just jumps out of them. Heigho. I finally manage to attach everything, but when I shut the window, the latch doesn’t sit neatly on the poking up bit. I unscrew it and redo it, not even saying any rude words. And look! I can keep my window open. 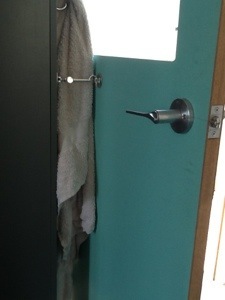 For an encore I attach the latch that was meant for the back gate to the outside bathroom door, to stop that blowing shut while I hang out clothes. Got it in one. Of course, if you had the kind of job that paid you $200 an hour, you would not attempt this kind of thing yourself, you’d get a nice young man in with a bag of functioning tools who never had to unscrew anything and reattach it the right way up. But I think you know what my hourly rate is.